Odd Nosdam is a hip-hop producer. David Madson, the mastermind behind the project, is supposedly one of the founders of Los Angeles independent hip-hop record Label Anticon. Nosdam has a heavy history with some notable bands such as cLOUDDEAD, Sage Francis and even produced a soundtrack for Element Skateboards' video "This Is My Element". He has a very eclectic style that normally stays within the realm of hip-hop but ventures to other genres. His productions are all over the place but are generally very good. Earlier this year he produced Serengeti's "Kenny Lewis LP". Check him out! My first exposure to Dead Meadow was on Emerica's ground-breaking skate video "Stay Gold". They have at least three songs in the whole video. Perhaps the best moment that utilizes Dead Meadow on the soundtrack is in the intro. The introduction is a gnarly time-lapsed video introducing all the members of the team throwing down huge tricks. It works well due to the band's honed psych-rock feel. The song is "Sleepy Silver Door", a seven minute straight up jam with fuzzy guitars and slick vocals proclaiming "I'm washed upon the shore of reality". From that moment on, I was a Dead Meadow freak. I immediately snagged their fifth studio album "Feathers" and listened it on repeat. If your a fan of classic rock, psyche-rock, or anything that rocks, check em out. You won't regret it. Check Out: No Joy - "Here Tarot Lies"
No Joy has always been one of those bands I was somewhat reluctant to listen to. Once again, not really sure why. As some of you know, I am an avid Pitchfork user. Earlier this year they gave No Joy's second full-length album a solid 8.0 rating, and if you're familiar with Pitchfork, you know that anything from a 7 up is really good by Pitchfork's standards. Even Bethany Cosentino of Best Coast tweeted about how good they are. So upon that rating and their fair-reviewed E.P. "Pastel and Pass Out", I had to finally check em out. And I'm glad I did. No Joy is a Montreal based duo that makes dreamy shoegaze music. "Here Tarot Lies" is a perfect example of what they are all about. It wastes no time, jumping right into the gaze as the song begins with great emphasis on fuzzy guitar and reverbed vocals. Check out "Here Tarot Lies" from "Wait to Pleasure", one of my favorite songs of 2013. Check Out: Weekend - "Jinx"
When I first listened to Weekend's debut album "Sports", recommended to me by cousin Kirk, I was hooked. My ears hurt for the majority of time I listened to them but I refused to turn the music down. That is one requirement that comes with listening to Weekend; they must be listened to VERY LOUD in order to really receive the full experience they create on their albums. Which brings up another great point about Weekend in general; they create albums with their own individual atmospheres. "Sports" was a beautiful, fuzzy, dark world surrounded in saw like distortion, a strong bass, and vocals blended with perfect reverb. Then there was their "Red" E.P. "Red" was a solid little E.P. of five songs that conjured lighter moments on "Sports" but with faster tempos and clearer...well, everything! Vocals were clearer, guitars were cleaner but still bathed in their perfect dose of reverb, and drums were still loud and proud. "Red" also produced one of my all time favorite roadtrip songs with "The One You Want". However, looking back now; "Red" was a transitional album. The 80's pop influence was beginning to show. And on "Jinx", boy does it show. "Jinx" is a dream-pop/rock album. And a pretty darn good one. They sound like a mature 80's pop band with influences of Tears for Fears, The Cure, and even New Order. While the album didn't quite leave me yearning to re-listen to it as much as "Sports" did; it did produce some killer singles. "Celebration, FL", probably my favorite song on the album, is a dreamy, synth-laden, wonderland of 80's pop. It's not that I didn't like the album, I actually still listen to it often, it just didn't feel as unique or consistent as "Sports". It is also their most accessible album. It's fun, it's loud... my ears hurt... I've been listening to them for the last half-hour. My ears need a break. 2013, as I've said before, has been a good year for hip-hop. It may have something to do with Kendrick's beast verse on Big Sean's "Control" with Jay Electronica. Kendrick literally drops the names of some of the best rappers currently, including Jay Electronica AND Big Sean (who he raps with in the same song), stating that he's trying to make them irrelevant and unimportant. It was a historical moment for hip-hop and shifted the focus from the typical nonsense you hear in hip-hop to keeping it real and taking things back to the way hip-hop was. Check out these LEGALLY free mixtapes from Flatbush Zombies, Chance the Rapper, Pusha T, Action Bronson, and Death Grips. Flatbush Zombies - "Better Off Dead"
Chance The Rapper - "Acid Rap"
Pusha T - "Wrath Of Caine"
Action Bronson - "Blue Chips 2"
Death Grips - "Gov Plates"
Check Out: Fire! Orchestra "Exit"
This is probably my favorite discovery of 2013. I remember scanning through RateYourMusic, and seeing this album pretty high up on the list for 2013. I had no idea what to expect upon my first listen to the orchestra. What I was met with was an overwhelming, exciting, and somewhat unsettling album of experimental, loose...jazz music? "Exit!" is a two song album stretching to roughly 45 minutes. The first song is nearly 20 minutes long and second is nearly 25. However, to get the absolute full feel of this album I recommend listening to it straight through without interruption. The dynamics in this release are to die for. Spastic brass, drums, and guitar create a world of madness that can last from two minutes to five. And just when you think you can't take it anymore, they completely shift things. "Part One", the first track on the album, highlights this feature very well. Half-way through the song the saxaphone, drums, and piano all come to a halt allowing one of the female vocalists to croon "Fire stay with me" atop one of the sickest bass lines I've ever heard. Give it a try. I beg you. And let us know how you feel about it! 2013 has been an absolute great year for Hip Hop. We've seen new releases from Kanye, Jay-Z, Eminem and Drake to Earl, Pusha T, and Danny Brown. This list is going to present some of our personal favorite songs from this year and why. "Numbers on the Boards" was my first experience of Clipse member Pusha T. His flow and lyricism is out of this world. Especially on top of a killer Kanye-produced beat. Danny Brown - "The Return Ft. Freddie Gibbs"
"The Return" is a direct sequel to Outkast's "The Return of the G" off of Danny Brown's new album "Old". This song deals with the idea of Danny Brown's "image" as being weak or soft. This is something that Andre 3000 experienced aswell. The beat is in the bass on this song and flow is ridiculous. Gibb's part is probably my favorite. Danny kills it too though. This is Detroit rapper Black Milk's two part single from his new album "No Poison No Paradise". It's a story covering his bring up and the contrast of his older years compared to his younger. "Sunday's Best" explains being a kid in a religious family. Milk is woken up in order to make it to church. "Monday's Worst" is his older years trying to survive by theft and stick ups. What are some of your favorite hip hop releases of this year? Let us know in the comments! This album might be from a year ago, but it definitely still worth bringing attention too. This is, in my opinion, one of the most overlooked albums of last year. I discovered this album through The Needle Drop, a great YouTube channel headed by Anthony Fantano (The internet's busiest music nerd) who reviews a wide genre of albums and rates them. Most of you probably have discovered his videos, and if you haven't, YOU SHOULD. I was watching his review of this album I just remembering how intriguing the album cover was. So after hearing Anthony praise the album, naturally, I had to check it out. What I was met with was a strange form of rock. It feels like 90's grunge music but with more finesse. The songs are very loose and don't seem to stick to a straight path which creates some very impressive dynamics. Even more impressive and interesting, Pile is simply a conventional rock back. There are no effects other than sharp guitar distortion. The drums are intricate and sync well with the heavy guitar. In another review of the album at Sputnik, the reviewer makes a very good point about the chemistry of the band on this album. As stated in the review, the drums and guitars seem to fluctuate with lead vocalist's crackly, full vocals. Combine this element with their uncanny song structures and you've got yourself one hell of a rock album. Check out the killer opening track "Baby Boy"
Check Out: Death Grips "Gov Plates"
Death Grips. Even their name is crazy. Consisting of MC Ride "Stefan Burnett", drummer Zach Hill, who has been in many acts such as Hella and Marnie Stern, and Andy "Flatliner" Morin, Death Grips blends hip hop, noise, and punk rock creating a truly unique style. Death Grips arrived on the scene with their free mixtape "Exmilitary". From there they only got bigger and bigger. "The Money Store" their second full length release was met with high acclaim and positive feedback. Their third release "No Love Deep Web" found them ditching their labels wishes and releasing their album for free and before the expected release date. Well, now they have a new album. It's free. And once again it pushes all the limits that have been previously established by Death Grips. On this release we hear even more truly bizarre beats and Zach Hill's spastic drumming. However, MC Ride takes a different route on this release. The feel is much less "Hip Hop" and more so "Experimental". If you haven't experienced Death Grips, I highly recommend you give them a listen. They raise the bar with every release and do so with a passion for making music. Ty Segall is the man. With at-least four or more bands/sideprojects and his solo efforts, Ty is keeping rock alive. Ever since I first heard "Caesar", an uncanny, fuzzy, and just plain weird song, I've loved Ty Segall and just about anything he is in since. 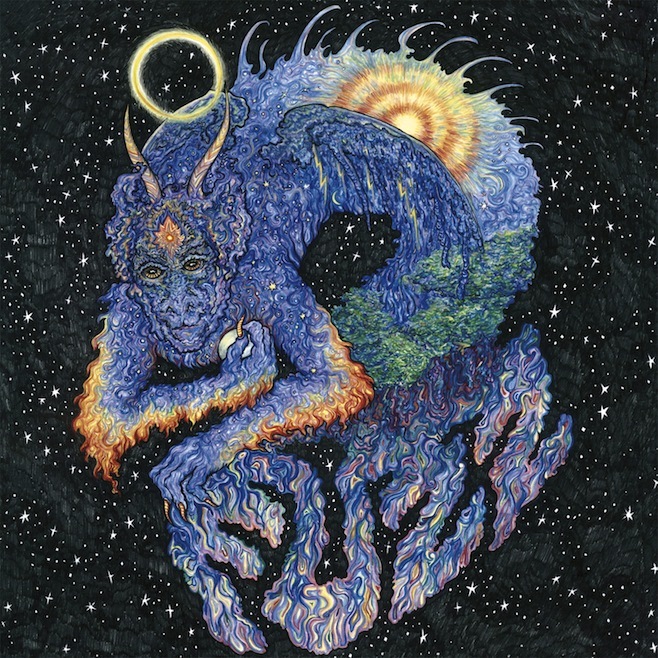 This album, "Fuzz" has all the attributes you would expect from a Ty Segall album: rock riffs that sound straight out of the 70's, fuzzy (no pun intended) and prevalent guitar distortion, and Segall's patented vocals. However, Segall is drumming on this thing. That's right! The majority of his endeavors feature him playing lead guitar. But on this thing he gets to show-off just how good of a musician he is by drumming and doing vocals. You can't leave out Charlie Moothart, though. Moothart is the riff-man. You might have heard some of his influence on The Segall Band's "Slaughterhouse". The riffs are slower than most Segall projects, but this what they want with "Fuzz". Moothart provides face-melting riffs and has some solid fuzzy leads over Roland Casio's exceptional bass playing. Check this thing out if your a fan of: Rock, Ty Segall, Black Sabbath, Face-melting riffs that keep you humming for days.